Modifications: I knit in the round until the armholes because I wanted to minimize the amount of seaming. I can knit while nursing. I can’t seam while nursing. So what’s next, you ask? 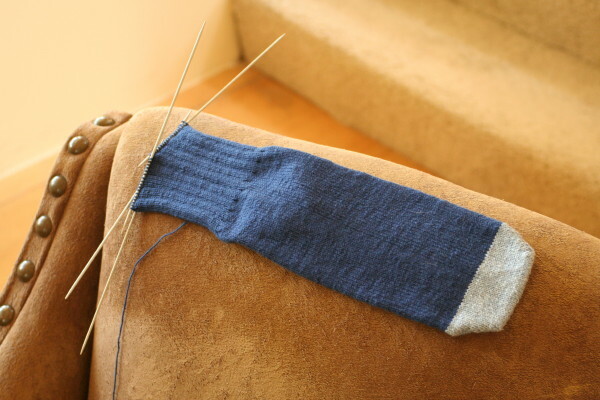 I still need to finish the most boring socks on the planet – remember those? Ugh. This is not a sock I look forward to working on but I’m almost done with the second sock so I’d be a fool to let them sit on the shelf, right? I also need to knit the thumb on my second Lapland Mitten. Can you believe that I’ve done everything but the thumb? How pathetic. You’re little one is adorable, as well as the sweaters! That’s the second time this week, I read on a blog, people can knit while nursing. How do you do it? What’s the trick? That’s the cutest little baby pinafore I ever saw! Gorgeous. Good thing you learned to knit and nurse. Congratulations! What a sweet little vest. 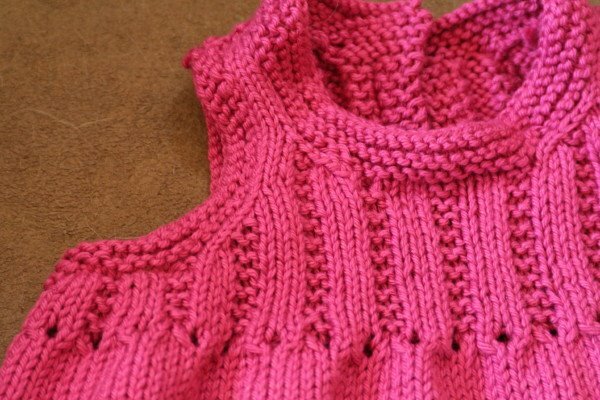 I love how the shaping blends right in with the ribbing. Yay! The eyelet vest is so cute. I did that one for a friend last year, but now that I see it again, I think maybe I should do one for my own baby girl. I love the color too! great vest! I’m going to have to get my hands on that book, sounds like there are lots of great patterns in it. Good thing you learned to knit while nursing! is that “boring” sock a tube? oR is there a heel? Your little one will look like a knockout in that! Beautiful! I’m there on the no-seaming while nursing. Ok, I’m not there on the nursing (many, many years ago) but I’m there on the no seaming! SO CUTE! I’ve got a whole drawer full of boring browns and blacks and greys waiting for me to make them into socks…boring socks with no detailing. Ick! Good luck with yours! 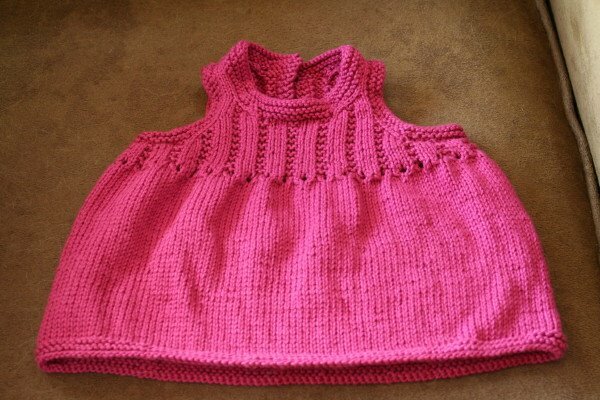 Beatrix is beatiful, she will look adorable in that vest. Well done!